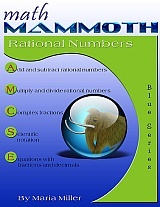 Math Mammoth Rational Numbers - worktext for grades 6-7. 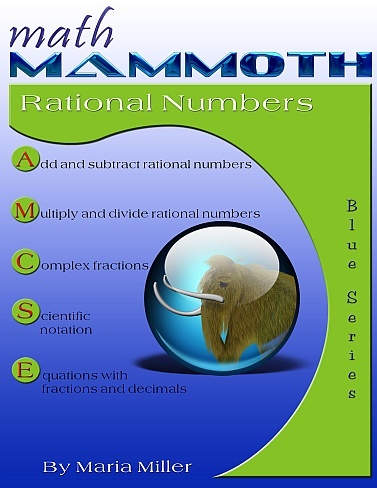 In Math Mammoth Rational Numbers we study rational numbers, which are numbers that can be written as a ratio of two integers. All fractions and whole numbers are rational numbers, and so are percentages and decimals (except non-ending non-repeating decimals). Hopefully, students already know a lot about rational numbers and how to calculate with them. Our focus in this book is to extend that knowledge to negative fractions and negative decimals. The first lesson, Fractions and Decimals, reviews methods of converting fractions to decimals and decimals to fractions. Next, we present the definition of a rational number, how to convert rational numbers back and forth between their fractional and decimal forms, and a bit about repeating decimals (most fractions become repeating decimals when written as decimals). The next lesson deals with adding and subtracting rational numbers, with an emphasis on adding and subtracting negative fractions and decimals. The next two lessons are about multiplying and dividing rational numbers. The first of the two focuses on basic multiplication and division with negative fractions and decimals. The second of the two compares multiplying and dividing in decimal notation to multiplying and dividing in fraction notation. Students come to realize that, though the calculations – and even the answers – may look very different, the answers are equal. The lesson also presents problems that mix decimals, fractions, and percentages, and deals with real-life contexts for the problems and the importance of pre-estimating what a reasonable answer would be. The lesson Multiple Operations with Rational Numbers reviews the order of operations and applies it to fraction and decimal problems with more than one operation. It also presents a simple method to solve complex fractions, which are fractions that contain another fraction, either in the numerator, in the denominator, or in both. After a lesson on scientific notation, the instructional portion of the book concludes with two lessons on solving simple equations that involve fractions and decimals. I have made a set of videos to match the lessons of this book. You can access the videos here (free).